I’ve not been meeting my self-imposed goal of getting a thousand words a day into this blog for two reasons. One is that I reinstalled my operating system, which meant parts are missing or do surprising things, so I’ve been trying to figure it all out. The other is that I’ve been absorbed in the 7Up series of movies about kids in England. I’ve heard about these five films for a long time and always thought they would be interesting, but to sit here in prairie Montana at age 68 and watch these English kids grow to nearly fifty has an enormous impact. One falls in love with them. No actors could ever duplicate this long arc of near-grub-dom through awkward metamorphosis to first flight to the high glides of maturity and then the beginning of a slow sinking back to earth. At the end of this set of films some are a bit bald, wrinkly, and quite a few are, um, hefty. Esp. the women. Tony, that energetic little rascal, remains true to his nature right on through his life -- still running hard, still riding horses as fast as they will go, and loving his children so much that it interferes with their discipline. Suzie, who made us worry about her for being a “poor little rich girl”, finds true love and suddenly blooms into a regal and balanced woman. John, who seemed to some so priggish and so invested in the wonderfulness of England, turns out to have deep roots in Bulgaria which he honors and develops by taking medical supplies into orphanages and hospitals where babies are so wizened and twisted that his wife, daughter of the former British ambassador to Bulgaria, turns her head to hide tears. (Darrell Kipp made a visit to Bulgaria and came back humbled -- when I make noises about my ‘umble ‘ouse, he tells me it is “Oh-pulent” compared with a Bulgarian one-room stone cottage furnished with a bed built into the corner -- to save the wood for three legs -- peg on the wall for one’s other set of clothes, and small wood stove on which to fry the single egg. There is barely enough to keep people alive, half-starved.) John is one of three little boarding school boys. Of the three Latin-singing boys, one turns out to be a hip and enlightened character (Charlie) who becomes a BBC producer. Andrew is the sort of steady person we all depend upon, keeping the world orderly. It is the upper-class boys who end up outdoors, digging gardens and taking walks with the kids. The set of three little public school girls turn out to be quite separate, though one is more different than the other two. Michael Apted, the force behind this series, says he didn’t see feminism coming or he’d have looked for more little girls. I’d say it came along and gob-smacked him anyway. The three little girls are tough, sensible and intelligent. They say they chose their own ways and they did. Two of them ended up single parents -- the fathers seem to wander off, not quite necessary after getting the kids started. Of course, the loss of their paychecks hurt. None seem to make child-support payments. The two little near-orphan boys who make you ache to gather them up when they are seven years old in their children’s home, turn out to be big, competent, child-loving men. Symon shows no sign of his mother’s tendency to depression but he does start out with a quiet life, a shy wife, and a cold job in a sausage factory -- then later he doubles back to a much more vivid woman and begins to take classes. Paul goes to Australia and finds a woman who loves him dearly -- the effect is something like the blossoming of Suzie when she found her husband. But it’s even stronger because of the broad Australian land, the redeeming beaches after all that British rain. Native Americans note the damage that boarding schools have done to their sense of family as well as being miserable places to live. But many of these people are boarding school students and “only” children, some of them sent off at quite a young age, and yet they are dedicated to their children, raise them without nannies and boarding schools, seem to understand “family” even as they remark they hardly knew their parents. The East Enders have a strong sense of themselves as a category and a culture: mom-loving, out for a good time, ready for a scrap. Strangely, the East End just disappeared under a tide of Middle Eastern and Far Eastern people. The original denizens scattered, those in Scotland saying it feels a bit like home. Bruce, the upper class boy with tendencies to mission work, only has to stay put and the needy masses come to him since he ends up teaching in the East End. He does go to Bangladesh where he is big, solid and blonde among the darting slim big-eyed people. Always focused and imperturbable, a steady anchor in a shifty world. Nick, the little farm boy in muddy Wellies, ends up in Wisconsin with a brilliant and beautiful wife. He’s a physics full professor, but he says, even after publishing two books, he’ll never be as famous for his science as he is for being in 7Up. And then this remarkable man, who moved me deeply, talked about the country hills where he grew up as a place where the clouds flowed across the sky, the water rushed across the land, the air moved around the grazing animals -- everything always in transition -- “poetic really,” he says. Then he remarks with perfect logic, that his physics work, which is the behavior of plasmas, is the same. There’s a sense of symmetry and fulfillment. By the last movie the subjects have either opted out or have come to accept Apted as a sort of weird relative who shows up every seven years to make them cry and admit secrets. They reproach him a bit, and they are pretty clear about their limits. Thousands of people write to these folks, recognize them, think about them and worry about their well-being. Attachment is a strange human phenomenon. We become so invested in images of people who are quite real but far away and no longer as they were, going about their business apart from the viewer all the years between the filming, never knowing the viewers -- though Neil says he’s become fairly close friends with some who wrote to him. When the earliest deaths come, they will hit many people hard. Me included. It seems that life itself is a kind of art form. Obviously if one lives from paycheck to paycheck -- or in my case from SSI automatic deposit to SSI automatic deposit -- one must plot and plan. One’s money comes monthly on Wednesday in the week in which one’s birthday falls. Day after tomorrow in this case. I have a very tight budget -- in fact, I come out about $50 short every month, a gap I fill by borrowing or selling something or just doing without something. Some strange menus towards the end of the month, more complicated by eating for diabetes 2. I rarely put off a bill, but there are some entities (like the power company) that systematically bill out-of-sequence with everyone else, so they tend to not show earlier payments and I can easily overpay by mistake or not reserve enough money to pay them. In fact, AT&T has been billing me about fifty bucks a month for a service I never use -- long-distance -- because I use calling cards. My phone company, when I called them -- since AT&T is invisible -- said that at one time I “froze” them into my billing and that at that time my phone company, a co-op, was prevented by law from providing long distance. In short, by changing laws and regulations on a level opaque to observers, they’ve been cheating me out of $50 a month. I shut them down and the “helper” said she sure wondered why I hadn’t done it sooner. (A common remark around here is, "Well, I thought that was pretty stupid but I didn't want to say anything." Aside from paranoia, let’s look at practicalities. On Friday, reasoning that most people would be shopping, I went to Shelby to do my wash at the laundromat. There are three county seats with laundromats, each about thirty miles from Valier which had a laundromat itself when I moved here but closed it down because it was “too much trouble.” Anyway, we’ve got a huge water shortage. Shelby is where I usually go. The change machine had no quarters. No one in town was willing to give me quarters. The change machine at the car wash had no quarters. I thought I’d risk driving over to Cut Bank, where the laundromat is attended, even though the machines cost $3 instead of $2.50 (They are newer front-loaders and actually do a better job.). I always used to do my wash there until I acquired a religious stalker who thinks we have some kind of relationship. When he sees my pickiup, he shows up to harangue me. The attendant hesitates to throw him out because his father is rich. The pitiable man is human detritis from a miserable marriage, not unusual in these small-and-getting-smaller former boom towns. Cut Bank is what’s left of a major oil strike. Anyway, the laundromat was closed. I had driven a 75 mile triangle for nothing, except that I had enough money to get my December meds. Not enough to pick up groceries at the same time. So today, Monday, I took stock. The forecast was 40 degrees and breezy. That meant I could get by with no quarters for the dryers, so off I went with my fingers crossed that the change machine would be reloaded. It was! But the temp was 14 and it has remained 14. I didn’t have enough cash to get enough quarters to dry everything. I could have gone to a store to buy something and asked for quarters in my change, but I thought that since things dry, machine or no machine, I’d just take some of the wash home wet. Anyway, if I wrote a check for $10, it might be enough to trigger a $25 overdraft charge because Netflix bills by automatic deduction (the ONLY one I allow) at unpredictable times and that could throw me into overdraft. $25 is a horrendous expense in a budget as tight as mine. But I need to call my money co-op Credit Union -- I thought I had automatic overdraft protection because of being a senior citizen. Actually, I’d have had enough gas if I hadn’t had to drive so far on Friday, but I had to put more gas in for this run and my gas card doesn’t work in Valier so I had to write a check. Exxon has closed out all its small stations and only supplies the big truck stops and casino-related food stores. The small stations are co-ops now and maybe I ought to get a gas card with this one. If I were still in the ministry and had to travel on an emergency basis, I would. Now a lot of fleece shirts are hanging in my front room -- it’s not a hardship. And my dryer, another remainder of the former tenant here, discarded because it was too old and busted to sell, is finishing off the small stuff -- socks and underwear. It never gets quite hot and the timer is kaput, so I have to set the kitchen timer, but it works. Sorta. I should run a clothesline in my garage. Actually clothes on the outside line should dry, since the air is so dry that moisture sublimates before it gets warm enough to melt first. The wet clothes were frozen by the time I got home. I think I’ll put the sweats out there. I’ll resort to another ploy: ironing the lightweight clothes. I had enough quarters to dry the sheets. Sylvia, the cousin who found me, sent me her grandmother’s journal from homesteading in Oklahoma before 1900. It is earlier than my grandparents in South Dakota, and since it was newly opened Indian territory (alas!) there was no infrastructure. They end in dugouts, tents, and a little house on wheels pulled by mules. They are rained out, flooded out, droughted out, baked and frozen, and more than a few died, sometimes beloved and indispensable people. A crook stole their mule and the courts were so clogged that though they went to testify repeatedly, delays kept justice from being done. These were religious people, and that helped. Who am I to complain? It’s clearly up to me to figure out how to cope at least as well as they did. After all, I have a big heap of shirts, they had maybe two each -- one to wear and one to wash by hand. None of them fleece. I got out an issue of Mother Earth and found a old-fashioned unautomated but motor-powered wringer-washer like the one my mother used to do my diapers. It costs almost $1,000. An ordinary Sears washing machine costs only maybe $300 with monthly payments about equal to the quarters I need at the laundromat. The catch is that it would cost nearly another $300 to install it! IF I could get the attention of a plumber. That may be easier as the housing boom dies down, except that it has not here. Lots of rich people moving in, thinking they will be safe. Surveillance cameras captured a photo of a pale car with two red doors on the driver’s side. Descriptions of the shooter tell his height and weight and what he was wearing -- but not his color. He dropped his gun. This is assumed to be the third in a cluster of shootings: one at 12:33AM at 6045 Woodlawn (Meadville/Lombard, my seminary, is at 57th and Woodlawn.) where a man was shot at; the next at 1:15AM when two women were actually robbed at 924 E. 57th; and the death of Cisse at 6120 S. Ellis at 1:26 AM. The gun is recovered and so is the car, which was -- of course -- stolen beforehand and abandoned afterwards. Could any car be more recognizable? Why steal such a car in order to commit a crime unless one were not rational? A counter-indication to grouping the shootings is that there were multiple men in the second incident, but the surveillance camera may not have picked up other men if they stayed in the car. On the other hand, if it took five men to rob two women, why were the first and third incidents a lone shooter unless he were some sort of maverick or unrelated? Was it a gang initiation? Was there a competition? What would be more shocking than a U of Chicago student shot to death? Why, if the shooter were a U of Chicago student! But this is unlikely. (Unless the victim were a thesis advisor. For those who have never tried to get a thesis accepted, this is a sardonic joke. But Amadou’s thesis had just passed. No motive there.) The shootings were just after midnight on a Sunday, which is a very dangerous time in a drug-saturated ghetto, because the addicts who have been partying since Friday are now out of money, not high enough to feel good but not yet crashed enough to be paralyzed. If the two women who were robbed were also students, they probably can provide a lot of information. If not, especially if they were black, they may choose to be non-committal because the very characteristics that make Cisse of special concern to the university, his brilliance and his foreign-student status, would make him “other” enough for South Side ghetto women to think of him as “other,” maybe a person who shouldn’t have been there anyway. Remember the reaction to O.J.’s trial. What if the shooter were white? It would immediately be a “hate-crime.” Especially if a noose were involved instead of a gun. A noose is now a marker for racism. Cisse was Senegalese, one of the parts of Africa heavily raided for the slave trade, and so his physical type -- dark, rounded and sturdy -- is almost what Americans think of as typical of African-Americans until we began to see so many photos of tall, thin Somalis with oval faces (often fashion models) and then all those basketball players who must surely have Watusi genes. He was Islam, the kind of gentle, patient, philosophical Islam that has a parallel in quiet, enduring, Bible-based Christianity -- but the news is shying off from mentioning his religion. Rather they emphasize the suffering of his family which has lost members in the unstable African nation. Cisse was nearly thirty, had just finished his Ph.D., and would have been returning soon, but if he had been killed there it would be one death among many of the kind. The main culture of Senegal, Islam, encourages acceptance of tragedy as God’s inscrutable will. Ours does not. Ours is preoccupied with deservingness. Thus there was less outcry when the Meadville maintenance man was killed. When I was there (1978 - 1982, with my third year mostly in Connecticut) three incidents registered strongly with me. One was a handsome young black man wearing a Harvard sweatshirt who had figured out that many of the huge old houses were offices downstairs, where visitors went in and out all day, and student housing upstairs, where the occupants rarely bothered to lock their doors. He raided Fleck House easily, partly because of his color and partly because of that sweatshirt -- two signals for liberals. He got Peter’s inherited and cherished pocket watch, but he got nothing of mine because Mike kept going into my room “to shut off the radio since I wasn’t there” so I reflexively locked the door even if I were going only down to the kitchen. The second incident came when a series of attacks on women had aroused feminist ire. (U of C officials seemed to just assume it was the price women paid and anyway, what could they do?) Since it was time for parents and prospective students to visit and possibly consider enrollment, the women managed to get the local crime records, made stencils, and spray-painted the legend “a woman was attacked on this spot” or even “someone was killed on this spot.” That in itself was not so shocking as the fact that these statements were seemingly everywhere. All day the U of C maintenance staff, wearing heavy rubber gloves, scrubbed with caustics to remove the paint, which lingered as pale smudges. The lesson was clear: this is a violent place but we don’t admit that. The third is fuzzy but more shocking. As I remember it, woman student living off-campus was shot to death as she struggled to unlock the door to her apartment building. It may have been a personal killing, which is somehow more acceptable, implying some sort of cause in the form of a grievance. The idea that education makes people invulnerable is a conviction that universities do not want overturned. It seems as though impoverished, drug-addled people don’t think at all. They are equal opportunity destroyers. Which is not to say we should destroy them, though we are pleased to destroy their “habitat” through gentrification. Meadville has been offered a new location in that gentrified sector. Maybe they ought to reflect on the assumptions of ghetto dwellers. 1. My niece and I had a long talk on the phone during which we discussed the wisdom of getting a pet at our age. (She is Bob’s genetic niece, was my student long ago, and is not much younger.) Our consensus was that it would be wise to get a pre-owned older pet. And we talked about parenting patterns: her grandmother versus her mother and whether it is right to call two sons (both she and her grandmother had two sons) her “boys” when they’re all grown up. She intends to keep right on doing it! 2. The BBC Victorian costume dramas I last saw were both preoccupied with the span of a human life and their success or failure in it. 4. The sequence of movies on which I have embarked almost obsessively is the Michael Apted 7Up series in which he follows an assortment of children born in 1964 through their ups and downs. They were supposed to be the best and brightest of various classes but eventually sorted out across the spectrum of happiness and success. Some of the most promising failed -- one of the most charming and imaginative became homeless. But Suzie, the little rich girl who seemed most trapped and cold, found a true love and was lifted into a real life. She is transformed. The kids have been followed into their forties now and I’m anxious to get there to see how they turned out. In real life right now they would be a little older than the first classes I taught in 1961, but I saw the same changes -- so gradual and then after a while such great transformations as to seem almost unbelievable. These days they run the tribe and BIA. Human maturation is not like watching a pup grown into a dog. The times change around them, so that their hair styles, their weight, their clothing, their accents change as they go along -- and they do have an impact with their own free will. Some of them become more themselves as time goes on. Still the clown, the “monkey,” the bundle of energy, the irrepressible Tony who wanted so badly to be a jockey and seemed so suited for it -- or John, still the traditionalist with hair falling over his face, impeccably dressed and intent on becoming a politician. My favorite, if that’s possible, was the boy who grew up in the country with cows, wanting to know “all about the planets” and who indeed turned out to be a major achiever early on. Yet he discourages any attempt to make much of him. The near-angelic boy who wanted to be a missionary turns into a rather thick young man with a fancy for cartography. (That’s maps, not autos.) One of the charity school boys went to Australia and became completely redeemed. I have “21Up” so far and have peeked at the preview for “49up” that’s on Netflix. There are four more for me to see. I think I will accompany these comments with photos of me at those ages. When those people were kids, many of them thought it was ridiculous to do such a survey and others thought they were being mocked for being stereotypes of their class. It will be interesting to see what they think at 49. Here I am at 7. It was 1946 and my “glamour uncle” was just out of the Army Air Corps and a pilot for TWA. He had married Jo Sutherland, a stewardess in the days before they had to be thin, and they had one daughter so far, Carol Lee. Carol was the first my “cousin set” to die -- she had ovarian cancer in middle age. These two men, Bruce (R) and Seth (L), were respectively the oldest and youngest of four children, the ones I called “the bachelors” because they were late to marry. When they did marry, they kept their traveling jobs and depended on strong wives to keep things running at home. This created a much different pattern than for the middle two children, who had a double wedding and remained devoted lovers in their two pairs and close companions among the four. 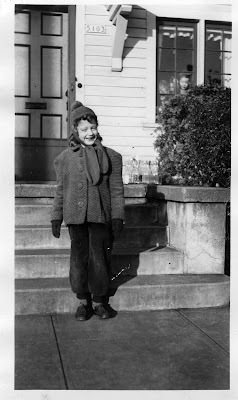 In those days I had leg aches all the time, which were said to be “growing pains.” My mother was advised to keep my legs warm and make me wear supportive shoes, so I wore leggings and nasty flesh-colored long stockings with suspenders over my shoulders, since I didn’t have a waist yet. I was a disaster at home -- way off in the clouds or storming or near-manic with glee. At school I was considered a model and a pet. I think these were the years that Joyce Thomas and I were best-of-friends/worst-of-enemies. 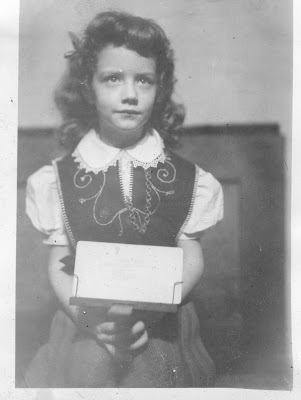 She was far more of a “lady” than I was and we walked back and forth to Vernon Grade School, battling or embracing. Then she went to St. Andrews, the Catholic school, and something happened to her father -- I don’t know what. We took piano lessons together once from a red-headed and tempestuous man whom I remember as “Von Burnowitz.” Once her very sophisticated uncle, a bachelor who lived alone in a hushed and carpeted apartment, took us to the ballet. Or maybe it was a movie. I’ve wondered since whether he were gay, which I would not have considered a debit. Nor do I now. Joyce and I did go to high school at the same time, but on different paths. It’s a different story. I don’t know what she’d say from her side. I don’t find a 7 year old photo of her. Once science seemed to have erased God -- or at least pushed Him way to the background so that He could no longer be claimed to causing things -- the people of the 19th century (those who weren’t preoccupied by the tasks of raw survival) must have wondered what really explained the success of some and the downfall of others. Seen through the lens of the secular BBC, two works of imagination offer different ideas. “He Knew He Was Right” is Trollope and appears to almost inscrutably doom a family of prosperous and agreeable people to suffer the rigid stubbornness of what had previously seemed to be a sunny young man of great promise. His obsession with his wife’s godfather, who indeed doesn’t mind making a bit of mischief, and his insistence on his wife’s buckling to his demand that she foreswear the man, never seeing him again, meets her opposite stubbornness, which might have been the quality that they shared and that drew them together in the first place. The victim, of course, is the child, who in this incarnation of the story stoically bears the hauling back and forth between them, a puppet. The story is almost senseless in its arbitrariness and orneriness until one knows Trollope’s life story. His father, who was no patient angel in the first place, had terrible migraines which he treated with calomel, a form of mercury which gradually poisoned him, dragging him into insanity. As he got sicker, he took more, until he died. Something similar happened to Louisa May Alcott and to Isak Dinesen. What we have here is a case of iatrogenic medicine, in which illness is caused by the supposed cure, but presumably Trollope didn’t know that. Both Trollope’s father and his fictional hero seem to have intractable willpower, which the family and friends try in vain to counter by reasoning. When the afflicted person dies, it is a great relief. The film makes a point of the faithfulness of the wife, right down to the moment of death when she finally buckles to his will, though he can no longer speak so must acknowledge her sacrifice with a kiss to her fingertips resting on his mouth. Better science might have saved this man, though Trollope wouldn't have thought that way. The other film, “The Mayor of Casterbridge” by Thomas Hardy, is quite different in that the difficult person is not at all ill, but vigorous and resourceful. He is a victim of his temperament -- of his genes, we might say, having read the most recent research. Though Ciaran Hinds, one of my favorite actors, shows convincingly how hard this man struggles against his inner demons -- his need to be “on top,” dominant, in ownership -- he always goes a step too far, triggering disaster. Again the only constant ones are a young woman and a simple oversleeping laborer. (The “least of these,” the simple servants so much admired in Christian homilies.) The young woman’s devoted disposition is explained in part by the appearance of her real father late in the story: he is a constant man but even he let her think he was dead. Otherwise, promises and secrets get thrown out on all sides. Fortunes are made, risked, lost and remade. The plot is a proper labyrinth in which the Mayor snatches defeat from the jaws of success over and over. Demon rum has a part to play. So here are two major explanations of why some people rise in the world and others sink. Misunderstood illness and genetic in-born temperament afflict and destroy these two heroes, before the theories about such things were even proposed. Rather hidden is the question of Free Will, which is one of the more famous solutions to theodicy, the problem of why bad things happen to good people. (If God kept making everything good and right, we’d just be puppets.) These men seem to be willful, to have traits that they ought to reject because they hurt those around them and ultimately destroy their selves. They have addictions, you might say, but is an addiction the fault of the addict or something that is beyond control, maybe the fault of the situation and maybe not? These are questions that can produce absorbing stories. The stories here provide contrast, people who rise easily or who rise in the end after enduring many trials. In “He Knew He was Right” there is a little farce about two goofy girls who hope to marry the shallow parson for the sake of the status and presumably a decent living. Then there is the “true love” story which hinges on the vagaries of a unloved and rather unlovable old woman -- finally converted by her niece who genuinely does love her (though no one can think why). Can’t beat that for heartwarming! Casterbridge is rather different because the town itself begins to participate as though it were a character, in the same way that small Montana towns -- structured by years of families contending against each other or maybe colluding for common goals -- develop a kind of consensus opinion and style. Once people are down, they feel justified in attacking them. (What a joy to see Jean Marsh -- “our Rose” from Upstairs, Downstairs! -- hoking it up as the key to the Mayor’s fate!) Casterbridge is a town where class lines evidently may be crossed -- the hero goes up across all the lines, then falls back to where he was before. Money is the operative force, so that the beautiful woman from elsewhere is nothing when she is poor, but suddenly respectable when she is rich. Yet Elizabeth Jane is quite preoccupied with airs and graces and this is lucky, since much of our affection for her comes from watching her efforts to paint or to write beautifully, working in the pouring light at her corner table. This particular actress, Jodhi May, brims over with tears so easily that one begins to want to give her a good shaking. One feels that her handsome Scot suitor is only considerate of her when it’s to his advantage, and yet she accepts his loss and then his reacquisition -- at least in this movie version -- without complaint or punishment. What makes the Mayor of Casterbridge so absorbing, so worthy of the talents of Ciaran Hinds, is his struggle against what surely must be a kind of inborn choleric nature that seizes him against his will and better judgment. His love for his genetic daughter is almost pride, then turns to rejection and coldness when he finds the true facts, then responds again to her actual nature, then is repelled from her by his awareness of his sins against her. The bird in the cage is quite truly an indication of his situation. The bird finally dies of starvation -- he does as well. 1. I’m blessed by whatever sequence of tiny events, triggering each other, modifying each other, building on each other, in order for this third planet from the sun to be what it is at this particular moment in time when I happen to be here. I take it to be an unfolding of creation entirely without a purposeful creator which nonetheless ended with apples and serpents, wars and lovers, dogs and cats, and all the seasons in their variety. I bless what is and it blesses me. 2. The gift from my mother at her death that made me able to buy this house in the very place where I wanted to be at the very time I needed it most. 3. My wandering history from Portland child to Chicago student to Blackfeet reservation teacher and lover to Portland animal control officer to Chicago student again -- this time on the south side -- to Montana circuit-rider to Kirkland bohemian to Saskatoon immigrant to Blackfeet Reservation -- this time at the south end -- to Portland civil servant to Valier, just off the Blackfeet Reservation at the SE toe. Now I’m grateful for staying put to think about it all. 4. The Welsh sisters, esp. the ones who bravely set off from Kilmarnock, Scotland, to the North American continent, marrying for better and for worse, keeping mostly to the West and creating a network of cousins who have only recently begun to find each other and sort themselves out. 5. Sam Strachan’s grandchildren, my own first cousins, esp. the ones with whom I grew up and the female cousins who have become almost sisters via email. And esp. for Scott, who sends me phone cards. 6. That I developed Diabetes 2 at a time when it can be diagnosed and addressed by stringent diet and constant attention, rather than fancy medicines or surgery. 7. Netflix! I could never had imagined it in advance! But also I’m grateful for being a child when movies were a Big Deal requiring a family expedition downtown and a Splurge at Jolly Joan’s afterwards. 8. I’m glad that my first war (I was born in 1939) was a righteous war that caused me to admire and revere soldiers no matter what has happened since or why they were military or even what country or cause they serve or what gender they are. 9. Cats are a blessing, esp. when they come to cuddle and purr and even when they rush out to do battle with their tails high and exploding with aggression. 10. I’m blessed by this web of Internet friends, esp. those who love books, write them and read them and review them -- all kinds. Even eBooks. 11. And I’m blessed by Blackfeet, Cree, Metis, and whatever other varieties have made a home on this reservation and been part of my life, whether working with me in the Scriver Studio or enduring me as students or arguing with me as an opponent. 12. And -- now lying latent -- the Unitarian Universalist connections that shift through congregations and life changes -- always different and always the same. 13. Big Ideas bless my life as I go hunting for “paradigm shifts” and “reframing” through my shelves of books and piles of downloads and magazines -- sometimes getting so excited that I can’t sleep at night. 14. I’m grateful to the University of Calgary Press for publishing my biography of Bob Scriver as I promised him I would do when I first met him a half-century ago. I’ll be even more grateful when the suspense is over the reactions begin to arrive, no matter what they are. And I’m grateful to Lulu.com for giving a home to the other books. 15. Houseplants make me grateful, whether the spider plants who like the house at 50 degrees or the geraniums who faithfully splash blood-red blooms in the sunlight of the south windows. I’m almost desperately grateful to the big silverleaf cottonwood just south of my house that loses its leaves in time to let winter’s raked sunlight flood through my south windows, but then makes a green, rustling parasol (para le sol) through the summer. 16. Likewise, we are all grateful to the snowfall, especially that which piles up in the mountains, rain engemmed into crystals and plates that will reach us next summer both in streams and underground through ancient layers of gravel. 17. Few are grateful to the wind. I am. Like the old Scot who slept with his foot out the window because it felt so good when he pulled it back in, I love the stillness that often comes in the night when the wind has stopped. Just as much, I love the hiss of snow on the windows and then the roaring when a Chinook arrives in winter. 18. I’m grateful for piped natural gas, so that I don’t have to find the resources to fill an oil tank out in the country, and grateful for my floor furnace where I stand with my hot coffee in the mornings with my nightgown billowing around me. And I’m just as grateful for my little cast iron stove in the garage and the idle but pleasing occupation of pushing sticks into it until there is a coruscating bed of orange coals and my cheeks are pink with heat. And for electricity. 19. I’m so pleased with my little kitchen appliances: the coffee grinder, the toaster, the waffle-maker, the food processor, the blender, the panini press, the microwave, the little grill for meat, the can-opener. 20. As well I give thanks for office gizmos: the stapler, the hole punch, the Rolodex, the file cabinet, the tape dispenser, the copy holder, the scissors and the (now defunct) binding machine. 21. Did I say how much I love the glass corner shower the handyman and I installed in the bathroom and the elegant white Victorian pedestal sink? 22. And did I mention my kitchen sink with a white counter and bright brass faucets? I’m so thankful that the handyman didn’t leave town until he’d helped me with these projects. 23. I’m thankful for the ancient crazy quilt that someone in my mother’s family made long ago from black velvet and wool plaid and peculiar prints on flannel, all carefully embroidered at the joinings and layered onto a paisley shawl, so that it’s an effective winter window drape beside me now. 24. My sewing machine is a blessing. 25. And this computer, eMac, all white and crystal. The season for hifalutin’ sentiments is upon us. Since one of those is recyclin’, here are the seven deadly sins one more time, this version being presented by Jimmie Carter at Hubert Humphrey’s funeral, quoted from Mahatma Ghandi. So far so good. Most people would agree that “wealth, pleasure, knowledge, commerce, science worship and politics” are overwhelmingly the substance of human life. But they would also agree that these massive concepts are all in need of amelioration in order to keep from going badly sinful: those safeguards are named as “work, conscience, character, morality, humanity, sacrifice and principle.” So, tinkering along with these terms, we see that the big stuff needs to include a kind of spine that governs what is done. I also notice that these are very English virtues. I propose that Gandhi was essentially English, in spite of his Indian-ness which was defined in Africa. That is, he learned the English from the rough side or from what a black female boss I had called “the underbelly of the whites” by which she meant what the whites call “the dark side.” In short, the treatment of the “other” and therefore the “beneath,” the oppressible. But in this context, “work, conscience, character, morality, humanity, sacrifice, and principle” are meant to be internalized (probably in a Protestant sort of internalized conscience) to PROTECT the oppressible. They are meant to govern the colonizers. In today’s American “success class” -- those who HAVE “wealth, pleasure, knowledge, commerce, science, worship and political clout” -- often the conservative, right-wing, Republican, “religious” folks -- claim to have and defend “work, conscience, character, morality, humanity, sacrifice and principle” which they take as license to oppress those who don’t, regardless of class or political party. On the other hand, the liberals and the defenders of individual rights do not claim either of these lists. It’s not that they defend “wealth, pleasure, knowledge, commerce, science, worship and political clout” but that they look to “poverty, pain, ignorance, nonparticipation, nonquestioning, atheism, and political absentia” as somehow saving them by chastening them. Strangely, these three categories would be easy to assign to religious institutions, denominations, faith traditions, etc., depending on how one classifies the worship styles of the power brokers, the dissenters, or the powerless. When a huge monolithic overwhelming category is created in the collection mind -- say, “religion” -- then it almost immediately evokes a lesser and opposite concept, let’s say “secularism.” These two forces operating on each other create a third concept (they call it a dialectic). So my list of the opposition to colonial values, the things that the power brokers will not tolerate in themselves but are willing to see as social evils “poverty, pain, ignorance, nonparticipation, nonquestioning and political absentia,” can be slightly “spun” (to use a Gandhian meaning for a modern PR term) into “simplicity, acceptance, mysticism, independence, faith, and endurance.” It is this dialectic that interests me and for which I give thanks. But should I? Is this based on conscientious morality or is it just about rationalizing my situation: old, broke, isolated, preoccupied, surrounded by books, connected to the world by a computer and the internet, accompanied by two big fat cats, visited by Blackfeet Indians. Listed in the same order used by both Pope Gregory the Great in the 6th Century AD, and later by Dante Alighieri in his epic poem The Divine Comedy, the seven deadly sins are as follows: Luxuria (extravagance, later lust), Gula (gluttony), Avaritia (greed), Acedia (sloth), Ira (wrath, more commonly known as anger), Invidia (envy), and Superbia (pride). Each of the seven deadly sins has an opposite among the corresponding seven holy virtues (sometimes also referred to as the contrary virtues). In parallel order to the sins they oppose, the seven holy virtues are chastity, abstinence, temperance, diligence, patience, kindness, and humility. Now, of course, we have abandoned free will and situation ethics, in favor of a genomic explanation, a kind of determinism. It is not YOU that craves chocolate and can’t get going in the morning -- it is your genes. The cards are dealt to you. The game goes on. The other day I “hit the jackpot” on the Internet and “won” a $500 shopping card at Target. This turned out to be a “catchpenny strategy” as Michael Allen would put it, and I’ve been flooded with spam -- NO shopping card. But Michael Allen offered to send readers of his blog “grumpy old bookman” free copies of his books and he DID! The one I was after was “The Truth about Writing: An Essential Handbook for Novelists, Playwrights and Screenwriters” which comes from his long experience in all these media. His Table of Contents suggests his approach: Ch. 1: What do writers want? and Ch. 2: Are they likely to get it? He’s quite serious about both questions, recommending deep introspection in the first case and serious scepticism in the second. But the chapter I found most crucial was “How the Publishing Industry Works or Not, as the Case May Be.” Since I’m staring “or not” in the eye, this is highly useful. Luckily, it’s also amusing if one doesn’t mind a little bitterness. Consider the case of the author whose book had just gotten to the bookstores: he hadn’t seen it yet and early readers remarked several times, “Up to your usual standard -- but the ending is rather unresolved.” Turned out that the printer had left off the last two chapters in every single copy and the publisher never noticed. Allen’s basic premise is that NO publisher knows what will be a best seller, therefore they print what’s most like the last success they stumbled upon or else work by people they know -- and simply hope for the best, which is not what happens. Meanwhile, because of the public’s conviction of the omniscience and power of publishers leading to marvelous rewards, the proposed manuscripts come tumbling in the door in floods, rarely to be read or even noted. It’s all simply an illusion. The glamorous model of Maxwell Perkins taking an interest in creating a classic novel out of Tom Wolfe’s haystack of impressions is a hoax. The gradual realization of this basic fact is causing publishers to erode, disperse, and gobble each other up. In the meantime, the failure of schools is causing manuscripts to be unreadable even if anyone ever tried. Allen notes that publishers are saving money by out-sourcing the discovery of talent to agents, often editors who lost their jobs. What he doesn’t note is a little hustle I ran across: the agent who “has a friend” who will play Maxwell Perkins and “clean up” your book for you -- at a price. To Allen, best sellers are created by word-of-mouth and w-o-m is created by emotional response in READERS -- not in the author or even the characters. If readers feel moved, they tell others. He has some practical ideas about emotion in writing. He has no use for the hierarchical notions of “high” literary writing versus “low” genre and no doubt that there’s a phallocratic element at work. Fine art is the work of gentlemen and trash is the messy product of women. Isn’t that right? Two chapters speak directly to practicalities: “How to Find the Energy for Writing” and “How to Find the Time to Write.” I was quite moved that his authority figures in these matters included Adele Davis and her recipe for “Pepup” which I tried myself in the Sixties or Lakein and his recommendations for time management, which I internalized long ago -- but ignore now that I’m retired. The near-last chapter is the one that is most eloquent for me now: “Success varies according to Circumstance.” And no one has control of circumstance, whether it is the chance reading of the manuscript by a person who appreciates it or the Bush-triggered erosion of the dollar that is confusing sales across the 49th parallel at the moment -- to say nothing of indignation already introduced by buying books on-line with no regard for national origin, thus ignoring the “gentlemen’s agreements” that have always loaded Canadian airport bookstores with US bestsellers while absolutely stopping all Canadian lit at the border. 1. The Montana Historical Society desperately needs a new building. Their choice of where to build is being forced by Jan. 31. They will be very much tempted to raid the Scriver Estate for money, which means they’d just as soon everyone forgot all about him or thought of him as “minor”. Since they’ve neglected to even unpack the estate, they were well on their way to blanking him out. Don’t admit you read the book! 2. The CM Russell Museum was tricked out of its share of the Scriver estate. They are sore and very curious as to clues about how this might have happened. Read the book and take notes! 3. Because I am the third ex-wife of Bob Scriver, followed by an alcoholic common-law wife who was the widow who conveyed the estate, the potential for imputing motives and mischief to me is high. But the fact that I was an ordained minister for ten years rather compromises that. Being a Unitarian has some potential for character assault, but the founder of Great Falls, Paris Gibson, and many other sterling Montana characters were also Unitarian. Read the book and cherry-pick the stories. 4. The Blackfeet complicate everything and they are central to this story. Read the book and assume they won’t. 5. Since both the stock market and real estate appear to be tanking, art is hotter than hot as an investment. Should a person invest in Scriver bronzes? Read the book. 6. Maurice Chaillot, Bob’s brother-in-law by the second marriage, remarked at Bob’s death that his reputation would sink for ten years -- then he would be re-discovered and crowned a genius. That’s just about how long the interval has been. Just buy the book -- who cares if you read it? Stuff like this will definitely affect sales. Clearly, people who have read the manuscript found that it evoked emotions. It is not “high lit” nor is it trashy tell-all. So that part is probably sound. But is no guarantee. The business model is the weakest part of the Circumstance: a small academic press badly overmatched by a digitizing and much less Anglophile world than they expect. One of Michael Allen’s successes has been workshops for teaching publishing staff what their jobs are supposed to accomplish. I fear this is doing to be what authors need to do for a while. Until we figure out how to self-publish and market. The cover of this book on Amazon is outdated. The "real" cover is a portrait of Bob in his cowboy hat with "Lone Cowboy" at his shoulder. Western art, as a sub-field of American art, has been shunned, ignored, disdained—and passionately loved. Those who love it continue to look hopefully for signs on the horizon that others have come to see the light... Scriver, with deep roots in the community where he was born in 1914, Browning, Montana, on the Blackfeet Reservation just east of Glacier National Park, concentrated on wildlife, rodeo and traditional Blackfeet culture in creating an impressive body of work over a sculptural career spanning more than forty years before his death in 1999. Bronze Inside and Out is a study of Bob Scriver and a meditation on the place of his bronzes within the Western art tradition. But it is much more than that. It is the best book we have on a working Western artist—at once intimate (Mary Scriver was married to the artist), objective, tough-minded and affectionate. It is ingeniously structured around a brilliant conceit, the stages of creating a bronze sculpture which are here made to correspond to the human life span... Here, Bob Scriver and his art become works in progress. We follow his struggles to express his personal vision, the hard effort necessary to make art and a career of art in an isolated Western town, the frustrations and realities of the commerce of art, the ups and downs of achieving the celebrity status that sells art, and throughout, we see the linkages between character, values and a specific artistic achievement. 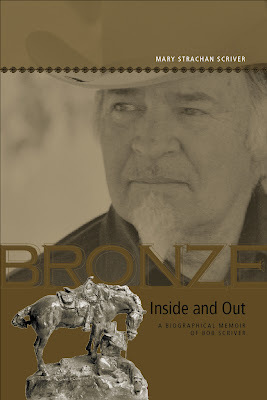 More than any other book that I can think of, Bronze Inside and Out puts a human face on Western art—indeed, all art. It invites us to ponder the very nature of the creative process. MRS. GASKELL'S "NORTH AND SOUTH"
My practice has been to watch each of my Netflix movies twice: once for plot, etc., and then again for craftsmanship. Lately I’ve only wanted to watch a few movies once. “1915” was an Aussie series with fuzzy photography, a tour of the trenches of Gallipoli. Two young buddies -- classic -- and two young ladies -- sure. Damage and loss right and left without much sense of what for. Ironically, one of the strongest characters is the gay man who managed to stay at home, though his true love went. It must have been the acting, for he seemed twice as intelligent as anyone around him. And “He Knew He Was Right” struck me about the same as the imdb reviewer who said, “The scenery was lovely and the music was very loud.” Too much stuff, too predictable, too faintly motivated, and so on. But since this is BBC, some familiar faces. It’s 2004 now and the sterling Geraldine James is out of her WWII “Jewel in the Crown” uniform, solidly married, a little wrinkly and heavier, but just as straightforward and strong. This time Cracker’s wife has two very strange daughters. In England an ugly or eccentric face can land an actor quite a bit of work. In this rather grotesque movie, an exceptional number of people had very long necks as though they aspired to be gerenuks (a long-necked African antelope, not quite a giraffe.) Jane Lapoitaire, as a twisted old maid with a fortune, does her usual fine job of looking weird but convincing. I agree with the critic who thought the main fault was that Oliver Dimsdale (whose first mistake was his name) just wasn’t up to his role. It was hard to understand why anyone paid any attention to him at all or, indeed, that he knew anything. But this is all piffle. “North & South” was recommended to me by the Netflix phone-answerer to whom I reported a lost disc. She said it was her favorite all-time movie so I put it on my queue. And she was right. This is a beautiful story, written as a short book by the estimable Elizabeth Gaskell. The length may be part of the secret since the Trollope (“He Knew etc.") is a very long book. “North & South” has been Googlized and can be read online, but it is in that kind of “ah, yes” rhetoric for which most of us have little patience. Still, the movie was so good, the book might be worth it. Maybe the simplicity of the concept will shine through the verbal curlicues. The romance in this movie is quite palpable and the voice-overs felt some real chemistry developed between the romantic leads. The only actor to be interviewed on the disc was Richard Armitage, who says quite frankly that he saw this as a “role of a career” and who put his heart into what could have been a Tim Piggot-Smith villain. By the time the lovers kiss at the end, so sweetly and tenderly, we want it as badly as they do. Armitage says they had to shoot that same scene more than a half-dozen times and suggests “it was a very pleasant day’s work” without him seeming sleazy or avid. Kisses like yellow roses. This factory wove cotton and killed the workers slowly when they inhaled the constantly wafting lint into their lungs. The camera was intensely aware of the beauty of this deadly snow and all the scenes of the actual working looms were full of imitation lint from what they called “snow candles,” a kind of gizmo used by movie makers. Fog was also constant and water in the form of puddles and drenching rain. The voice-overs (production staff) also explained how the “north” was shot to be dark, gradually lightening as the heroine begins to understand what she’s seeing, while the “south” was vivid in the beginning, but sort of blurred and ambered by the end. I thought of one of my parishioners in Saskatoon who said that after years on the bleached prairie, she went back to the lush English climate where she grew up and found it stifling, too much. In short, the crew of craftsmen and artists working on this film were clearly resourceful as well as loving the story. The great satisfaction of this story is its symmetry, which also includes another father/daughter pair, working class which in that situation meant little more than slavery, but working for betterment as much as the clergyman and his daughter. I quite fell in love with Brendan Coyle who played Nicholas Higgins, and again, the voice-overs said they felt the friendship that developed between this defiant father and Thornton, the stubborn mill-owner, was as crucial as the love story. So, the lesson is: simple forces that act on each other with symmetry and synergy, not destroying each other but influencing each other for the better as understanding develops. Excellent casting of people who know that less is more, that heart shows in the face. Skilled craftsmen with strong aesthetics and the means to bring them to the screen. If a person wanted to put it in one word, maybe “truth” would be it. Not in the sense of facts, but in the sense of human basics and emotional honesty. Artistic truth. I just loved it. As much as “Jewel in the Crown?” Yes. And for the same reasons: human stories against the great grinding wheel of history which yet cannot destroy love among people. This is Mrs. Gaskell's heart-of-hearts conviction. Today when I walked up to the post office my mailbox held an assortment of alumni mags from the University of Chicago. I’m probably the only M/L alumn in the state but there are maybe a few dozen U of C students. I don’t know them -- I’m just aware they exist. The mags are meant to stimulate me to send money to the schools. Right. My SSI check no longer covers my essentials the way it did when I moved back here. The magazines tell about hundred million dollar bequests. Anonymous, of course. Very nice. I’m interested in the “U of Chicago Magazine” stories about endocrine research, specifically the reciprocal relationship between blood glucose and insulin, the importance of receptors on the cells as well as producers of the metabolizing molecule. The difference between a kind of diabetes that is caused by a shortage of insulin has not been sorted out properly from the kind that is caused by a refusal of the cell to accept the insulin, thereby accepting so much glucose as to do itself damage. Doctors only see DIABETES -- run finger over to treatment column: drugs. Med schools are not teaching critical thinking or logical deduction. I take a personal, bodily you might say, interest in this. “Criterion, A Publication of the University of Chicago Divinity School” is much less slick and rah-rah in its approach to alumni. The articles tend to be transcripts of addresses given at Div School events by the faculty and better students. Anyway, Div School people don’t necessarily make money or even value money all that much, though they are pretty competitive in many ways. The currency here, as Carl Sandburg put it, is “Do you love me, kid?” It’s all about parenting, nurturing, being grateful, mentioning God now and then. This slips into pandering among those of less stature and discipline. A long piece delivered at a lunch talk is by J. Ronald Engel. “Making the Earth Covenant at Chicago.” In the Seventies tipping to Eighties, a very risky time in the history of Meadville/Lombard, Ron was the only faculty member of a staff of four at the seminary that the students would tolerate. He badly wanted to be recognized as a major scholar, which one does in this world by writing, but suffered from writer’s block. One summer I was his graduate assistant which meant that he gave me a long list of books about the Indiana Dunes to read and report on. One result was that my right shoulder and knee became eroded from packing books back and forth to the massive Regenstein library. I feel those joints rather keenly some days now. (I was forty, about the same age as Ron.) The other result was that I began to know a great deal about the Indiana Dunes and how places become sacralized until they amount to pilgrimage destinations and natural cathedrals. I was already vulnerable to that idea through the “Limberlost” books of Gene Stratton-Porter, although she was kind of literal about it. (Freckles plants a clearing in the tall timber so it’s like a chapel, etc.) Sandburg lived at the Dunes. Engel had such a close relationship with his originally-classmate and then colleague, Shadle, that we took to calling them “Shengel.” One did not make a move without the other, though they were rather different. Shadle would invite you to his apartment -- Engel never would. We realized why when someone was in a building adjacent-to but higher-than Engel’s and looked into his apartment. “It’s ALL WHITE,” he gasped, "Even the carpet!" In more ways than one, despite many accounts of going to the South with James Reeb who was martyred there in a march for integration. In many ways I was much too tough for this little seminary, too ascetic, too scornful of middle-class tweed prestige and luxury. (I’m even too scornful of Valier merchant/rancher-class velour-sweats-clad luxury.) And I remain that way reading Engel’s version of an “Earth Covenant.” It personifies, it sentimentalizes, it deifies, and it moralizes. Oh, oh, oh -- how beautiful nature is! Quite ignoring drought, famine, flood, fire and all manner of unkindness from Mother Nature. Sure, say I, the Deep Ecologist, we’d better shape up and reform our ways because we go down with the ship! Pray to the storm all you want -- if you don’t bail, row and admit you’re but a cockleshell with the hubris to put out to sea -- you go down with the ship. In fact, even if you DO all the right things and think carefully, you might still go down with the ship. Worrying about global warming are you? Try making an “earth covenant” with a viral plague. Whether as all-creatures or as just-ourselves, we all die, pretty words or not. God or Dog -- neither has anything to do with it. Engel quotes Richard Wilbur’s poem, “Advice to a Prophet,” which is a blast against the hubris of thinking we know what will happen or what we should do about it, but Ron shows no real understanding of it, or he would end up as some of our tough outdoorsmen environmental writers have: slipping off their chairs to weep on the floor. Instead, back goes Engel to speak of “mystical naturalism” and “realities of faith” and all his wonderful friends and mentors and sponsors and students. It’s a nice polite Div School lunch, after all. I don’t know whether “Circles” attracted so much comment because of people googling or whether these were readers all along. I’m thrilled to have found another cousin! Fascinating that what started out to be about the descendants of the volatile and opinionated Archibald Strachan has gradually moved over to being the story of the seven Scots Welsh sisters! The marriages of those “girls” turned out to determine the fortunes and locations of descendants for generations. There are both celebrations and cautions when doing this sort of thing -- as any genealogist or biographer could tell you. Take, for instance, the first marriage of Bob Scriver (biography now listed on Amazon: “Bronze Inside and Out: A Biographical Memoir of Bob Scriver”). In the beginning, years ago, I sent known relatives copies of my rough drafts to figure out what their reactions would be. I found out in short order: a threatened lawsuit! The descendants of that first wife from a second marriage were convinced that their mother had been grievously wronged and any implication on my part of an alternative explanation was going to be contested. The facts were that she was 19, a junior in high school (which suggests she had lost some credits somewhere - she was not a scholar) and he was 23 when she became pregnant. They married 11-20-38 and their daughter was born 6-19-38. Whether Bob took advantage of a student (he WAS her teacher) or she entrapped him for the sake of escaping school, is open to interpretation. Likewise, most of what happened to that branch from there on is controversial. And troubled. The sexual revolution, which no longer comes down so hard on babies out of wedlock or even multiple relationships, has meant that what was once shameful and life-changing is now handled in a much more casual way. If the ordinary scandals of long-ago are far enough in the past to have no living interested party, telling about them might be safe. But opinions and guesses become even more foggy and must be identified as uncertain unless there are legally recorded facts like divorce decrees, death certificates, and birth certificates. I think of about 1950 forward as a good place to stop unless I have proof. One of my most important tools has been a time-line. Indeed, the photo albums plus a memoir by an uncle have been very helpful in figuring out what happened when and where among the Strachans, especially after they left the prairies and came to Oregon. As a previous genealogist of one family branch, the Finneys, was careful to record, the macro-history of the nation, the weather, and planetary politics also suggest how to interpret what happened. I try to record the history of the Blackeet tribe as well as some of their members and fellow-travelers and had never really thought about the impact of things like locust plagues or the dust bowl on the willingness of Congress to fulfill treaties -- but the unwillingness to funnel money to reservations when white homesteaders were starving was very clear. To use myself for a relatively safe example, my father -- thought to have a lot of brainpower and being the only grad school MA -- was a Scot. He was fairly steady and patient -- quite an entertainer in company -- until he was overloaded and then he was pretty scary en famille. He married a woman more English and Irish who had been forced to break off her college years because of the Depression. He made his living by traveling, which meant she was left alone like a political wife. She was fiery, competitive, a hard-worker, and made vulnerable by the cancer death of her mother when my mother was a young wife. In terms of achievement, I got contradictory patterns and capacities: on the one hand the introspection and literary aspirations of a Scot -- on the other hand confused ideas of conformity mixed with public status. In general, the present cannot be grasped very well, not even the recent past. And the impact of misadventure and war are hard to assess. A great-uncle on each side of my family was badly damaged by service in the Philippines. Both wandered off into alcoholism and homelessness just like Vietnam and Iraq veterans. There is no surviving explanation of efforts to help either one of them. Evidently the strategy of choice was to seal them off so they wouldn’t contaminate or weigh-down the rest of the family. My father’s uncle’s son completed a methodical and elaborate chart of all the people he knew of and he was careful to pass that on to younger people. I’m looking for younger family members who can happily receive all this stuff. The best thing about the timing is that now I can easily make duplicate copies and post versions online so that family members way out there on the edge can find them and join up with them, always a joyous thing to do. But there is a dark side, too. Because Bob Scriver was famous, people have claimed relationship and privilege in his name when they were not at all entitled. Mighty pesky and sometimes verging on the criminal. Another worrisome aspect is trying to understand the difference between modest discretion and self-serving secrecy. I’ve learned not to post some photos or some knowledge because people about whom I care become scalded and very angry, just because it is public -- nothing shameful or embarrassing. Often things that I think are funny and charming. There are common-knowledge and often-told stories here on the reservation or in the local small towns, some of them QUITE true, that could NOT be put in blogs without the blogger getting punched. But at the other end is the idea that knowing hidden genetic relationships, discovering lost information, admitting long-kept secrets, can have a healing effect. Telling family stories is a matter for some serious reflection. Ask Strom Thurmond. Or, well, Thomas Jefferson! I always meant to be a writer, not just to be a writer, but to write -- whether or not I got published. At present one of my too many projects is typing up my paternal grandmother’s journal which she kept faithfully all her life. I’m not going to do the whole thing, but I did type out one whole trip she and my grandfather made and now I’m typing up 1935. As she writes, she is sixty, the family is struggling for money, and she is rounding up her credentials in case she has to return to teaching. IF she could get a job doing that. But most of the entries are “did the wash -- it rained” and “baked a cake for supper -- good.” I also have a bit of my maternal grandmother’s journal, which is rural and largely about how many eggs she got, since they badly needed the egg money. When I’m going along in those journals, it’s as though I were them -- just a little bit. We’re poor in solidarity, I guess. When I was young, people gave me diaries with locks for birthday presents and I dutifully wrote in them, trying to be passionate and conformist at the same time -- so self-conscious I was like a puppet. When my marriage was in trouble, I wrote notebooks to myself, then began to suspect my husband as secretly reading them, and then laid some traps for him that proved he was. So I wrote in them what I ought to have said to him. It was the wrong delivery system. When I went to seminary, nearly forty years old, I wrote one page a week, single-spaced, made copies and sent them back to my home church as well as to family and friends. I did this for four years and have them all. In 1996 or so I discovered email and internet bulletin boards and then list servs. I have pages of messages back and forth that I couldn’t bear to lose. Some of the people have died. Some of them I’ve forgotten but remember when I leaf through those files. Some of them would be very angry that I saved what they wrote. Those were the days on the internet when one “flamed” others and told major secrets and got lost in the amazement of it all. For the past few years I’ve been blogging. And doing Print on Demand. I deliberately blog on a topic as chapters of a book -- er, blook -- and then print it on Lulu.com. The Edmonton Unitarian Church once published a book of my prairie sermons, called “Sweetgrass and Cottonwood Smoke.” I still have a box of them under the bed. They show up on the used book websites. Soon my biography of Bob Scriver, “Bronze Inside and Out, A Biographical Memoir of Bob Scriver,” will be distributed by the University of Calgary Press. Then what’s the next step? I don’t know. But what moves me most is that often late at night or early in the morning -- sometimes they sort of run together -- I get an email about some blog entry that I wrote many months, even years, ago. Maybe just an obituary of some older Blackfeet friend that I typed up, adding comments, and it will say, wistfully, “Did you really know my great-grandmother? What was she like? I grew up in the city and never met her.” Then I wish her grandmother had written a journal, just about how many eggs there were and what a packet of buttons cost. Nothing dramatic. Two school trustees were re-elected, C.L. McKee and Richard Croff. This starts Croff on a new term after service on the same board of 21 years. He was one of the first elected trustees. For many years prior to the first election, trustees were appointed by certificates issued from the county superintendent of school’s office in Choteau. In 1918 Mrs. Isabell Cooper received a patent to her allotment and became an owner to patented land within the bounds of the school district about a mile from Browning. This made it possible for an election to be held as polls might be established on that tract. On election day in 1918 voters numbering 94 went from Browning and cast ballots for three trustees, of whom Croff was one. Many others served with Croff through the years and he has helped to make many changes from a small school of two rooms and about 50 students, mostly in primary grades, to a school second to none in the state, with 570 students from the kindergarten through high school. The high school includes 125 students. This plant has a value of nearly $230,000 and includes a dormitory, auditorium with a seating capacity of 1,500, a domestic science department of manual training and Smith Hughes department, typing and business department, a large library and study hall and a science laboratory. Besides this school plant and its more than 20 teachers, there are in the same district six rural schools, the largest of which is Starr School, accomodating over 100 children. Croff was on the board when the transition was made from a little school to the big modern school. This came about when the townsite of Browning was thrown open to sale. In 1919 the general land office offered lots in the townsite and these Indian lands were sold for the benefit of the Blackfeet tribe, again turning trust lands into patented and taxable area. About this time also much other land in the district was patented in like manner. All of this made taxable income and a basis for a bond issue of sufficient size to enable the trustees to build and equip a school big enough to accommodate the fast increasing number of school children. By 1920 the two-room school used in 1918 was so overcrowded that five other rooms or buildings at various places in the town had been rented and the school was scattered all over town. The district was bonded for $25,000 and by doing this made a deal for cooperation of the government to set aside one city block for a school. The government agrees to set aside $15,000 to match the district bond money. This was done by a special act of Congress. S.B. Hege of Washington, DC, through his friendship with J.H. Sherburne, gave invaluable assistance in this. He followed the measure, with information given him by the Browning school board and by his personal acquaintance with those in Washington, including Senator T.J. Walsh, to passage. When the school was completed, it was necessary to get other funds besides the taxes, so it was planned by the school board to request the payment of tuition by the government for the school privilege to Indian children. This was arranged by contract and approved by the Indian department but could be paid only after it was submitted to the comptroller general. In a letter from J.R. McCarl in the fall of 1921, everything was held up by him for the reason that he construed the wording of the bill that Indian children should be admitted “on equality with the whites” to mean that because the whites were admitted without tuition, Indian children should be admitted likewise. Many such difficulties have come up over the years and in his capacity as Chairman of the Board for most of the years, Croff heped to unravel the trouble. Two years ago Croff met Edwin S. Hege, son of S.B. Hege. Edwin S. Hege inspected the school. NOTES BY Prairie Mary: This little story contains many important American concepts, most principally the idea that schools should be funded by taxes on land. A problem arises when the land belongs to a government entity rather than an individual or corporation. Indian reservations, military land, wilderness, national forest, and so on do not pay county or state taxes. Therefore, if there are to be schools on these lands, the federal government must compensate with funds. Also, public schools are normally state/county functions and so could not be established on a reservation without the creation of an area considered to be returned to the state, called “patented,” which presumably meant that the person to whom the land was alloted by the federal government was a competent person who did not need federal protection. Then the patented land is treated like a bit of state land that is located within the federal land. This complexity of jurisdiction has given rise to many issues and controversies. It is ironic that at present the reservation charter schools, usually primary grades in a few rooms with a total of maybe fifty children, are considered the most progressive innovation -- though they are a return to a system that was used a hundred years ago. 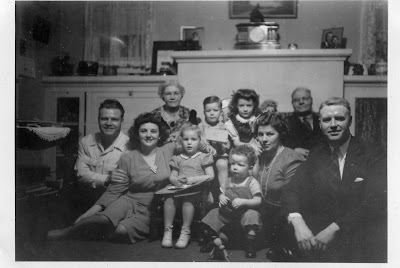 Upper left shows Mr. and Mrs. R.J. Croff. Mr. Croff has been a member of the District 9 school board for 24 yers and chairman for the last 12 years. The view next to the upper left corner shows the light court and finished roof of the remodeled part of the school. Upper right shows workmen removing steel trusses from the old roof over the gymnasium. The right center picture is of workmen laying the new roof. Loer right shows the brick wall completed around the light court. At the left of the court is Robert West Wolf, one of the first two full blood Blackfeet Indians to be graduated from Browning High School. The lower center picture is of William Spotted Eagle, the second of the first two full bloods graduated from Browning High School last May. Trustees of the Browning schools were confronted with the problem of not only enlarging their building but modernizing it so as to meet the requirements of an up-to-date school. The building lacked gymnasium facilities. The gymnasium did not have adequate seating room nor shower bath facilities. The auditorium, which was used for study hall and laboratory, was a dismal place with skylights. There was no space provided in the building for teaching home economics. Many of the classrooms were small and overcrowded. The lavatories were poorly located and poorly equipped. With so many shortcomings the local school authorities began working several years ago on a plan of modernizing their school building. To finance such a program an effort was made to obtain an appropriation through the Indian Bureau of the United States Government. A complete survey of the building program was made by Supt. K.W. Bergan, and a plan of remodeling was presented by the architectural firm of J. Van Tylingen of Great Falls. The discovery was made that the funds available would not cover the building program contemplated. Through the suggestion and cooperation of Warren O’Hara, superintendent of the Blackfeet Indian Agency, a works project was developed to provide the labor for remodeling the old building. The school district furnished all the materials, and after a series of delays which involved several local and county problems, this project was finally approved and put into operation on December 26, 1935. The first step in the remodeling program consisted of removing the maple floors in both the auditorium and the gymnasium. In order that this maple flooring might be salvaged, it was removed very carefully. All the nails were pulled and all the seams cleaned. Enough was saved to re-floor all the portion of the building remodeled. In a similar manner all the floor sheathing, floor joists and considerable brick, as well as radiators, piping and lumber from all the partitions were saved. The rooms of both the auditorium and gymnasium were left in position so that during the month of February, while the thermometer was registering fifty below outside, the men on the inside were pouring concrete and laying brick. Not one day of labor was lost because of bad weather. During the winter months two shifts of men were used wth an average of 25 men to a shift. A large amount of labor was necessary to salvage the old building. The plan of remodeling consisted of placing a light-court in the center of the building so that all the classrooms would be lighted through windows instead of skylights. Around this court was placed a new study hall, library, a science room, a set of home economics rooms and administrative offices. The light-court was filled with three feet of dirt which was thoroughly tamped, covered with cement floor and drained. This was done with hand labor. The spaces for the vault and the laundry was likewise filled with dirt and covered with a cement floor. This was all done during the cold winter months. The laying of bricks for the new walls around the court presented a problem because of shortage of bricklayers and the short hours which they work. This, however, was gradually overcome, and ceiling joists were put in place during the month of March. During April a period of good weather prevailed. During this time the old roof was removed, all the joists and rafters were salvaged as well as the sheathing, and the new roof was placed on the building. Then work of placing partitions was started, which was followed by the installation of electric wiring, plumbing and heating plants. The old heating system consisted of two heating plants. The one plant had two cast iron sectional boilers while the other plant was of large single cast iron boilers. To make the heating system more efficient it was deemed advisable to put in a central heating system which consisted of two steel tubular boilers. During the months of June the floors were laid. Nuwood beveled tile was integrated into the finish of the rooms. All the finish wood in the remodeled portion of the building is oak and most of it came from the mill ready to install. Cabinet work was installed in the office, study hall, library, science room and the home economics room. During July and August the work consisted of sanding th floors, installing new cabinet work and finishing materials, staining, varnish and painting. The interesting part of this program has been that the work has been performed almost entirely by Blackfeet Indian labor. During the month of May a construction program under public works, another under the rehabilitation and the erection of a new hospital put an enormous strain on the number of skilled workers on the reservation. This required importing a few skills for labor, otherwise there were sufficient among the Blackfeet Indians to do all this construction during the past year. The board of trustees of School District #9 consists of Mrs. Vina Chattin, Joe Brown, Leo Kennerly, C.L. McKee and R.J. Croff, Chairman. Note: The present superintendent, Mary Margaret McKay Johnson, is a descendant of Joe Brown. After all the maniacs, torturers and zombies of our times, who is the scariest person of them all? The cornered little man with no scruples. “A Half Life of One,” written with elegant parsimony by Bill Liversidge, a mild-mannered Englishman writing near Strachan, Scotland, is one of the most chilling horror stories I’ve read. And it could happen anywhere. Nick Dowty’s very nice business has just collapsed due to circumstances rather than bad management. Nick is a man who is constantly managing, always looking for the work-around, the profitable corner to cut, the appearance that saves the day. But none of it works this time and the slide to the bottom is taking his exasperated wife and scornful son down with him. Lashing and blaming, then hiding and doing-without, Dowty is willing to do most anything except, say, take any job that comes along like stacking shelves in a grocery store. This is what his hard-working wife wants, nearly orders him to do, but he blanks that out. Not that he’s without energy. He prowls the neighborhood, which he knows very well. It added considerable interest for me to know that the territory near Cairngorm and the river Dee, where Dowty thinks of poaching salmon, is the original seat of my birth family, Strachan -- which we pronounce “Strawn.” I had no idea that the Highland Clearances (comparable to clearing the prairie of Indians so as to make the land profitable except that the people eliminated were poor Scots) had left hidey holes all over the area in the form of collapsing farm houses or even caves. The idea of poaching salmon is triggered by sighting a supposedly wealthy and certainly beautiful young woman who is fly-fishing for the big silver creatures. But Dowty is not seduced by the beauty of it all nor is he inclined to fish for food, though he’s near starving. Rather, his thoughts run to big nets and fish-stunning poison in order to sell to the trade. His very soul is seized by commodification. The obvious way to commodify a rich woman is kidnapping. He sets about his business plan but this is unfamiliar territory and despite his resourcefulness and diligence of preparation, he has little notion of what can go wrong. The force he knows the least is himself. At first the reader thinks that all this blundering, often hilarious, will end with some kind of realization and insight. Maybe this selfish little man will find a way to end up on a yacht in the Caribbean with this fine woman. Then slowly the horror grows, entirely logical but sometimes surprising beyond imagination. This story is about the banality of evil, how small insensitivities and neglects lead to crimes of omission more damning than malevolence. It is also, rather indirectly, about the relentlessness of profit, which grinds up anyone in its path. This is a time in history when we read about disasters so much that best-selling books and a pack of cards are simply advice about how to escape or at least cope with danger, from sharks to quicksand. (There really is NO escape from being in the World Trade Tower when it is hit by a huge airplane.) Many of us have learned that a selfish, blaming boss can be the worst hazard of all to anyone trying to earn a living in a dignified way. More than that, our very “civilization” is forming too many people into Nick Dowty by neglecting children. One of my favorite though rather ghastly stories from animal control officer days is about the old woman and her “friend” who lived in a small house on a side street. She went to visit her sister, said the friend, leaving him to watch the place, keep up the yard, and that sort of thing. She was gone months. The sister was evidently ill. Neighbors thought nothing of it. The social security checks continued to arrive and be deposited to the joint account. Bills were paid. Then one day a telephone lineman up a pole looked in the upstairs bedroom window and saw a blanket with a human form outlined in mold and rot. The sight was gruesome enough for him to go to the police and, of course, it WAS the old lady. The friend had not killed her, he’d just sort of not let her die, in a way. He wasn’t quite the monster that Dowty could be, and didn’t consider himself a gentleman of sensibility as Dowty did. Another story is about a man who went through exactly the kind of financial meltdown as our antihero except that his empire was actually a bit bigger. His family left. He sat on the front porch and rocked and pitched all the bills and notices and threatening letters into a box, then several boxes. He’d found a little cache of Reader’s Digests and one of them said what to do if a person went bankrupt. It said, “You will be called to a meeting of financial advisors. Sit quietly and tap your fingertips together. Say nothing. They will take care of it all.” That’s exactly what happened, except that there was a patch of land up by Neah Bay in the NW corner of the state of Washington -- nearly inaccessible. No one wanted it. So he went there and built a little cabin. The area was so beautiful that he took photos, then people asked to buy them, then he made a bit of money and built a better cabin with a dark room in it and then... Well, when we visited him, he was turning work down so he could sit on the porch and rock. This counter-story comforts me after reading “A Half Life of One.” It’s not about radioactivity, but rather about a half-person who lives only for one: himself. Quite horrifying. This tale will haunt me. And I was already rather haunted by the Highland Clearances, to say nothing of clearing the prairies, even though the Strachans were Dakota homesteaders when they emigrated.